A trip to the Land of the Midnight Sun and the Sami People. In Kiruna and Gällivare you experience nature and meet the Samis, the indigenous people of Sweden. You will also get an insight into the transformation of two cities as a result of mining for more than 120 years. A double edge event for the society, people lose their homes to be able to continue their living in that astonishing nature with its unique e culture. Arctic Night Train will leave Gefle on June 16 at 7 pm to the northern part of Sweden. After a good night sleep on the train, you will arrive in the morning in Kiruna, the City of Mining 200 km north of the Arctic Circle. 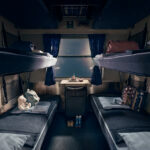 NOTE: You have to book the Night Train and Accommodation by yourself. It’s not a packaged tour. Hotel and travel is not incl. We´ll start with a guided tour in Kiruna, one of the mining cities of LKAB, to you will learn about the moving of the City center and the implication of it before we continue to Jukkasjärvi. 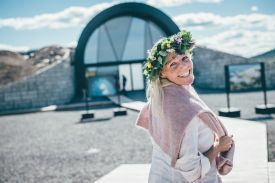 At Nutti Sámi Siida – Márkanbáiki, with grazing reindeer and historical buildings you will be served a Sápmi slow food lunch and will learn more about reindeer herding and the Sami culture. 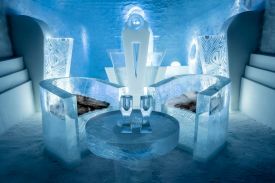 A visit to the world famous ICEHOTEL 365, a permanent ice structure including luxury suites, each with private relax and bathroom. As well as a large ice bar that serves champagne, and an ice gallery. At the visit, you enter an environment of -5 degree Celcius dressed in a warm coat. Thru the window, you will see people dressed for a warm summer day bathing in the River of Torneå. After breakfast, we gather in the Lavvú where the famous Sami Laila Spiik has a lecture about Sami Culture, food, nature, animals, herbs and spices. local food is served in the Lavvu. The afternoon is free time with an opportunity to book activities offered by local tourist companies. Book your return trip on the evening of June 18 or stay a few days and book a round trip before leaving Lapland. OBS! Länken kommer att ersättas efter att korrekturläsning och ändring är gjord. 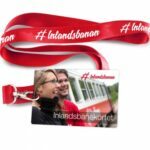 Book one way or return trip on the night train, or take a return flight from Gällivare or Kiruna to Stockholm. Meeting Point at Resecentrum, close to Quality Hotel Lapland. North to South via the Arctic Circle. 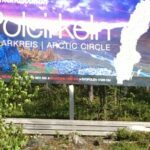 3-day roundtrip Kiruna to Narvik in Norway. You have to book an additional ticket Gällivare to Kiruna.